Our 2010 cover on the war against the phone book. We never did find Wendy Jacobson. She, if you recall, was the mysterious woman who claimed that she'd met her husband ordering a "beef and cheddar" at Arby's in the Valentine's Day Inlander cover story. But while we had her name and her email, we didn't have her phone number. And we didn't have any reliable way to find it. It's, increasingly, become a frustrating irony for journalists. Even as the internet has stripped away our privacy, the rise of the cell phone and the end of the phone book have made what was once one of the easiest pieces of information to find one of the most obscure. With your name, I can look up your speeding tickets, divorce history, parenting plan fights and restraining orders. I can find the microfiche of your juvenile assault charge 30 years ago. I can see which Washington state elections you voted in. I can learn if you've been in any car accidents. I can find if you've donated to any political parties or causes. I can find your address, look up your deed, find who you sold it to and what it's worth. I can find all the times you've emailed city officials and, with a couple legal exceptions, what exactly you told them. I can find the quote you gave to the Whitworth College student newspaper in 1989. I can find all the racist things you said on Twitter and all the sexist jokes you made on Facebook. But finding your phone number? That's where things get tricky. There are stories I haven't written because I could never find a way to contact a key figure. It's one thing to say "Harold Sourceman did not return multiple messages asking him to comment on his alleged involvement in the goat catapult scandal." It's another thing to say, "we had no idea how to let Sourceman know he was going to be the front page star in a goat-hurling related controversy." 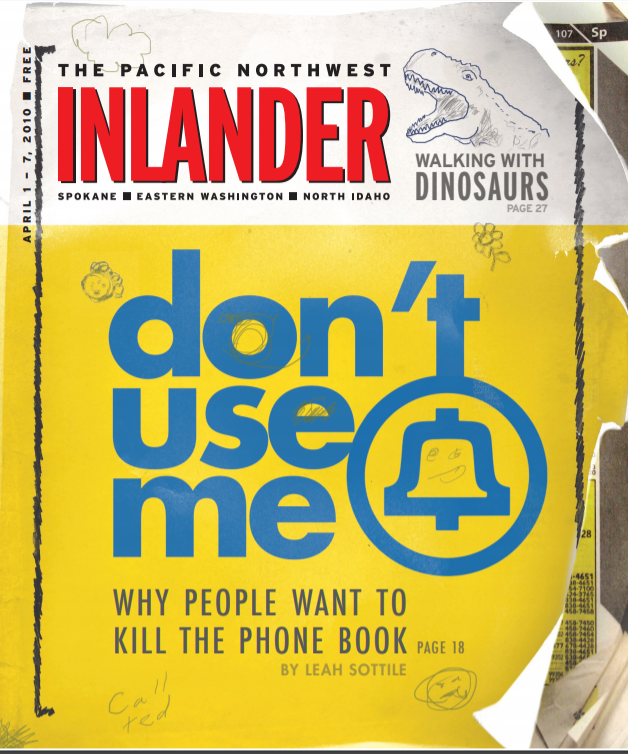 We should have seen this coming: In 2010, then-Inlander reporter Leah Sottile wrote a big story about the campaign to get rid of the phone book. The problem wasn't just that Internet directories made the phone book a fat stack of wasted paper. It's that people were transitioning to cell phones. In 2008, Sottile reported, 20 percent of Americans had ditched their landline and switched to exclusively use cell phones. Today, that number seems laughably small. Nine years later, over half of American phones are without landlines. A decade ago, you might have trouble finding a number for someone under 30 — while older fogies were listed in the phonebook. Now, even my parents — my lame, fuddy-duddy, late-adopted parents — have switched to smartphones. Social media was supposed to make contacting people easier. For some people, it has. Find a person on Twitter or Facebook, slide into their DMs, and then wait for them to reply. But many people aren't as extremely online as I am. They let notifications pile up. You send a message out into the ether and then, months later, get a "sorry, just seeing this!" message. It used to be that having your phone number publicly listed was the default. A few had their private numbers unlisted: politicians, judges, cops, teachers who didn't want students to interrupt their evening bubble baths with homework questions. But for most of us, our phone number was one of our most public pieces of data. But our phone numbers have become taboo. I'll often call a person and ask if they can give me their friend's number for a story I'm working on. "Uh, I dunno," they say. "I don't feel comfortable just giving that out." Even if I do get the number, they make me promise not to tell me it was them, as if they were leaking state secrets. There are good, rational reasons why so many people keep their phone numbers secret these days. In fact, as the podcast Reply All has detailed extensively, having your phone number too public is dangerous these days. It's one tool in the hacker toolbox to pull off a social engineering ploy, where they use your publicly available information to seduce, say, your phone company or your bank to hand over your account info. These days, our phones aren't just a tool to call girls we have crushes on and ask them if they remember what our math homework was tonight, if only to hear their voices. They're little life-destroying blackmail boxes we carry around in our pockets. So the ironic thing is, as yet another Reply All podcast points out, phone call companies have given unethical users the ability to not only purchase our phone numbers, but our actual physical location on the black market. Newspapers richer than the Inlander have traditionally used subscription databases in order to find numbers for sources. But even those databases are becoming more limited. Buzzfeed reports that, in the UK, Journalists had been banned from a program called Trace IQ through LexisNexis Risk Services, to find information like phone numbers. Fraud investigators and debt collectors could use the service. But media companies could only use the tool if they could prove the data was "not being used for investigative journalism." Many of those databases are highly unreliable or out of date. When I look up "Daniel Walters" on White Pages it immediately gives you the number to my parents' landline. But I haven't lived there for a decade. And they don't own a landline anymore. Call the number, get a Verizon "your call cannot be completed as dialed" message. ZabaSearch, meanwhile, correctly identifies me as working for the Inlander, gives my correct work address, and says I studied at Whitworth University. But it also, very incorrectly, says that I'm 52, lived in Sandpoint, Washington, am related to a "Shannon Walters" and that my middle name is "Wayne." Both sites promise to give you my phone number if you pay a surcharge. But the errors don't exactly inspire confidence. If I can't find you, but really need to talk to you, I have to search my old bag of increasingly ineffective tricks. I Google your name and your area code, hoping to stumble across a church bulletin, an event announcement, or a PDC filing that has lists your phone number. I get used to "the number you have called has been disconnected or is no longer in service" messages. I call people with similar last names, and hope they're related to you. If I can find you on Facebook, but can't reach you by Facebook Messenger, I message all our mutual Facebook friends I can find who might have your number. If all else fails, and I can find your address I can always do things the old-fashioned Coach-Taylor-on-Friday-Night-Lights way. I randomly show up at your door. Or, at least, I hope it's your door. "Harold Sourceman," I growl as the door opens. "You're a hard man to find." The Spokane City Council might eliminate helmet requirements for Lime bikes and scooters, but should it go even further?